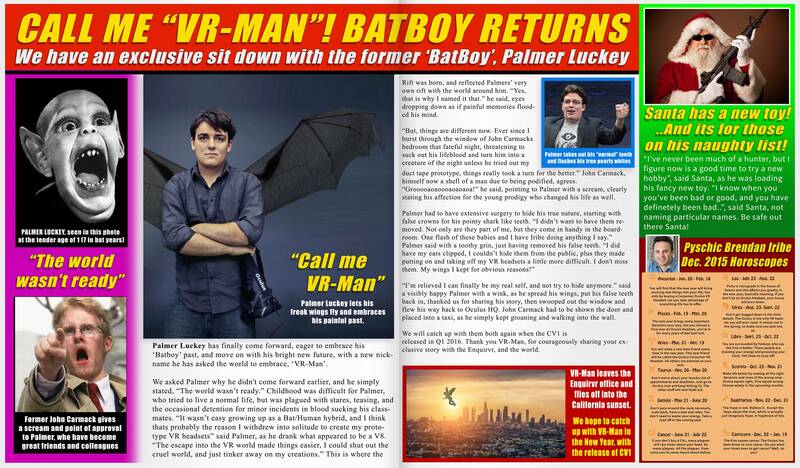 Note from the Editor: Those who have been following the Oculus subreddit closely over the last year have likely already been introduced to the unique brand of VR humor from Damien Labonte (aka Damo3000). His clever satire of the industry has put a smile on our faces since the moment we first saw it, and I am proud to say that he will now be joining us as our humor contributor. Damien’s first column – The National Enquirvr – will release monthly and is designed to put a lighthearted spin on some of the industry’s biggest headlines and rumors – serving as a reminder that no matter how serious things get in 2016, we should never be afraid to laugh at ourselves. Happy Holidays Everyone! The content above is purely satirical, and should not be taken as fact. But if I had to tell you that, you probably have bigger fish to fry.